The NPD Group's September hardware sales report fails to mention two other important platforms viciously battling for gamer's attention—Rock Band and Guitar Hero, two games that saw big releases last month. So who won? According to a boastful official announcement from Apple Corps, MTV Games and Harmonix, the winner of the monthly music game battle was The Beatles: Rock Band, the "#2 selling title across all genres by revenue in the U.S. for the month of September." The Xbox 360 and Wii versions sold well enough to chart in the NPD's top ten video games for the month, with the downloadable single "All You Need Is Love" racking up over 100,000 downloads. 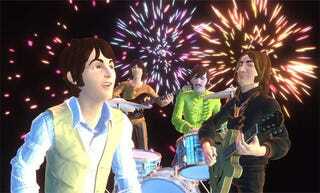 The Beatles: Rock Band folks further rub their victory in Activision's corporate face by pointing out that Guitar Hero 5 shipped on an additional platform (the PlayStation 2) and even included a copy of Guitar Hero: Van Halen thrown in for free.